“Tainted” by Helen Macdonald is a contemporary, scifi fantasy that explores the dark side of the human experience. The first few chapters of the book are available for purchase on Amazon. One of the highlights of the available chapters is Macdonald’s writing. With fresh, crisp prose, she captures a wide range of human emotions. The fantasy elements in “Tainted” allow Macdonald to flex her imaginative wings. The result is some extremely creative ideas, such as the Alternate Realm Variator and interesting conceptions of genetic alterations. Despite the fantasy elements, Macdonald does not neglect developing her characters. Her characters are extremely dynamic, and their dialogue is true-to-life. The chapters give the reader an idea of what is to come. For instance, the character Reagan talks about being chosen for combat at age 10, and the reader anticipates action. The rich plot is shown through a variety of perspectives. Each perspective gives the reader a new insight into some aspect of the plot. This technique is particularly powerful in showing both sides of the characters’ relationships. The story is written in first-person, present tense, which allows the reader to have an intimate connection with the characters. 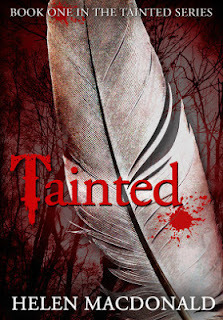 Overall, the available “Tainted” chapters will have readers clamoring for more.